With the opening of Jock Lindsey’s Hangar Bar next week the transformation of Downtown Disney into Disney Springs continues. And now we have word of a couple more possible restaurants and bars that might be joining the lineup at Disney Springs. There are reports that a new restaurant called Walt’s and a bar/lounge called the Neverland Tunnels will be added to Disney Springs in the coming months. Both locations will reportedly be adjacent to The Edison. While there is no word yet about what Walt’s might be, some are speculating that it might be similar to the Disneyland Paris restaurant of the same name. And the Neverland Tunnels might actually run underneath the old Adventurer’s Club! There is no official word yet from Disney about these possible locations. 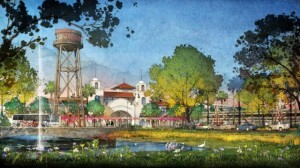 The Downtown Disney area is expected to have an official “renaming” to Disney Springs later this fall.